Be Bold. Wear Blue. 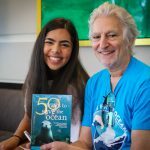 March for the Ocean Shirts Available Now! At a resistance gathering, citizens rally and march toward the White House. (Blue Frontier Campaign). Nine years ago my niece was murdered while working in her college coffee shop by a stalker who was later acquitted by reason of insanity. Even though he was schizophrenic he’d had no problem walking into a gun store in Colorado and legally purchasing the 9-mm pistol with which he’d then driven across the country and shot her to death. Johanna was 21 and planning a career in global women’s health. As gun violence has continued unabated I, like many reasonable people, believed nothing was going to change. On February 14 seventeen students and staff at Marjory Stoneman Douglas High School were killed by a 19-year-old with a legalized military assault rifle, one of a string of mass shootings in Florida and across the nation. And then things began to change as the several thousand surviving students refused to accept politician’s “thoughts and prayers” and instead demanded action that has led to nationwide student walkouts, demonstrations and lobbying at statehouses and in D.C.
On March 24 the March for Our Lives will confront the existential short-term survival threat posed by gun violence in America. On June 9 2018 people who love and work on the ocean will confront the existential survival threat to all life on our blue planet posed by the rapid decline of ocean and ocean-linked climate systems. 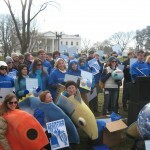 Wearing Blue and Marching for the Ocean in Washington D.C. and from sea to shining sea that day will prove either a colorful gesture – or a turning point in bringing these critical issues into the public sphere where they can be debated and acted upon. When I was covering a revolution in Central America, the young people risking their live at first talked to us reporters about getting help from the rebels in the hills. But a few weeks later they’d stopped talking about “the rebels” and started talking about “we rebels.” Shortly after that, the dictator and his army were defeated. When the March for the Ocean becomes Our March for the Ocean, our victory – a healthy ocean and clean water for all – will also become a much realer possibility. BFC representatives, Jaime D. Sigaran and Alex Fozzard, lead the Maryland and DC delegation with M4O partner: Surfrider Foundation. And don’t doubt my historic analogy to a war. The avarice, greed and ignorance that’s impacting our ocean today poses at least the same scale of global threat as Fascism and the nuclear balance of terror held in the last century. 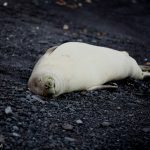 Unfortunately, that threat is now being expanded by an administration and Congress in Washington that views our public seas and connected fresh waters as little more than a gas station or a place to dump mining waste and other garbage. In defending the salty crucible of life on our planet we are also defending our blue economy and equity as the poor suffer these environmental insults disproportionately be it from dying reefs in the Pacific, eroding native villages in Alaska or extreme storms in Houston, Florida, Puerto Rico and the Virgin Islands. The question is do we have the power to reverse course? Potentially, yes. Just our 100 March partners to date regularly reach more than 24 million people, or about 11 percent of the U.S. voter population. 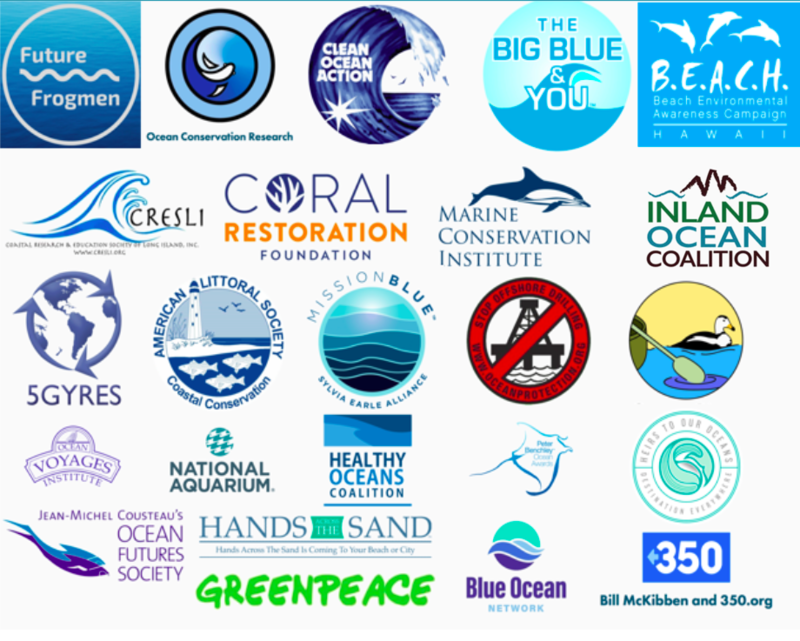 Support the March for the Ocean by making a purchase today. 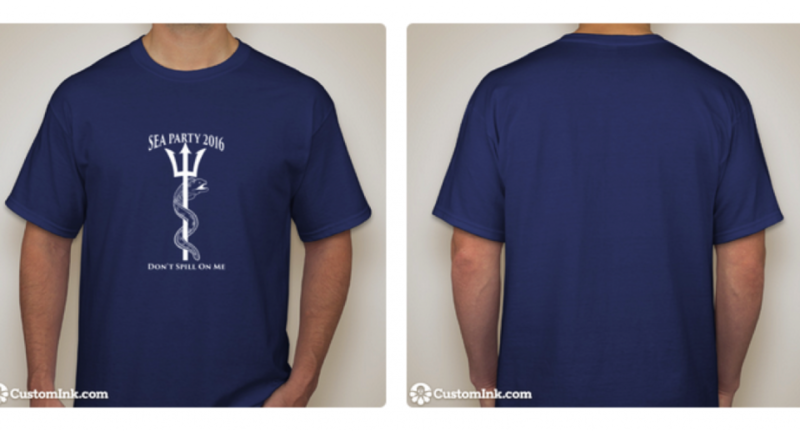 It will give you something blue to wear on June 9 plus help pay for the march. Each of our partners will also directly benefit from becoming March leaders. 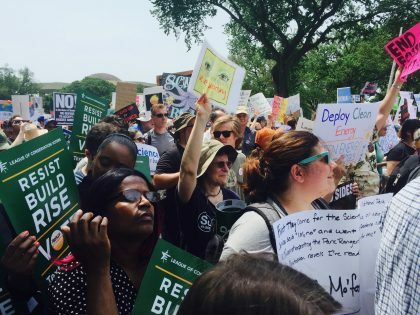 If you are “the largest and most influential grassroots environmental group in America,” how could you not also be leading the first large march for the 71 percent of the environment that’s Ocean? 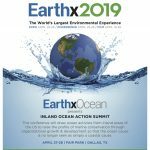 If you are “the world’s largest international ocean conservation organization,” how could you not want to lead the largest march ever held for the ocean – and for issues such as offshore drilling you campaign on? If you are “protecting the oceans, waves and beaches that give us so much enjoyment” how could you not take pleasure in leading a celebration and defense of those same resources? 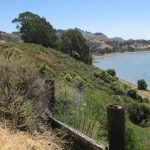 If you “helped pass our nation’s bedrock environmental laws” you know how the environmental protests of the 1970s made passage of those protections possible and will want to lead the next wave of environmental protest to defend these same bedrock laws – like the Clean Water Act and Marine Mammal Protection Act – now under attack. If you “will never stop fighting for a greener, healthier world for our oceans, forests, food, climate, and democracy” you’ll want to be at the forefront of a massive ocean march and next wave of democratic resistance while also mobilizing the colorful ‘kayaktivists’ who helped defeat plans for offshore drilling in 2015 and will gather again on the Potomac River on June 9 2018. 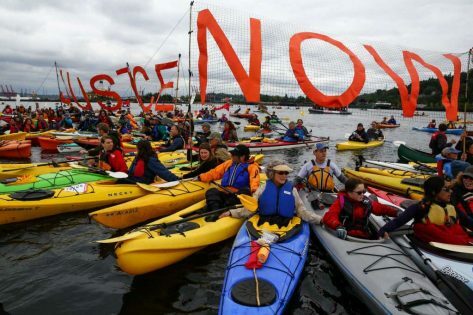 Kayaktivists take to the water in Seattle’s port. (Joshua Trujillo, SeattlePI.com). 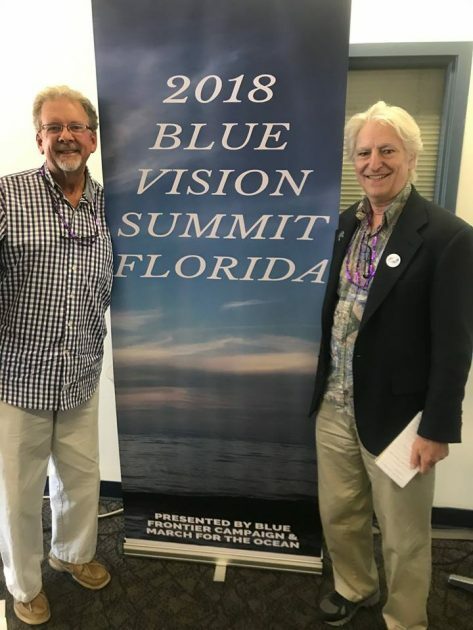 Blue Frontier Campaign’s executive director officiates Blue Vision Summit Florida with the Marine Exploration Center in St. Petersburg, Florida. 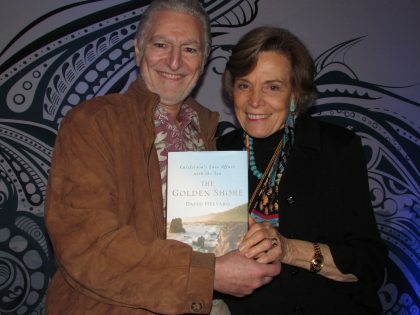 Executive Director David Helvarg meets with Her Deepness, Dr. Sylvia Earle on a discussion about ocean protection. Watch it now. Or as National Geographic Explorer-in-Residence Dr. Sylvia Earle explains on one the proliferating March for the Ocean videos: “I’ll be marching for the Ocean. You should come too. Why? Well, the fish can’t be there to say what they need to say, the whales can’t be there, the turtles, the ocean, unless it rains – that’s’ the ocean sending us a message – but we need to speak for those who cannot speak for themselves…so be there, come celebrate, come be a voice! Watch our latest M4O videos featuring Dr. Sylvia Earle and many more! Sign up your organization for a committee! Like, Follow, and Subscribe to M4O channels on Facebook, Twitter, and Instagram. Explore at our UPDATED M4O Toolkit. Donate to Blue Frontier Campaign.